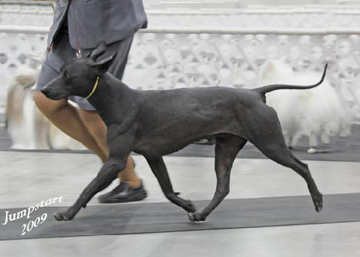 Current information on dog shows that include the Xolo. …in Portland, Oregon is a good place to be this weekend. The daily results of conformation are: Daily Results for the Xolo Cita . We send our Best Wishes for an enjoyable event for the many Xolo owners and their Xolos. BOB Winner, Besitos Munequita with her owner-handler Teresa Vila. Jo, we are with you in your sadness. Teo was a great Xolo. The two of you were wonderful ambassadors for he breed in every country that you visited. May those memories always bring you joy and pride. We have been very proud of you. …message from Randy Simpson: “Besitos Macahui is a new AKC Grand Champion today in Turlock, CA !! :):)” Felicidades!!!!!!!!!!! …”Macahui got her first Group placement today in Tucson, AZ” Congratulations, Randy and Macahui!!!. Owner: David Berry & Alvin Lee Jr.
…Besitos Munequita, owned and handled by Teresa Vila, is now an AKC Champion!!!!!!!!!!!!!!!! 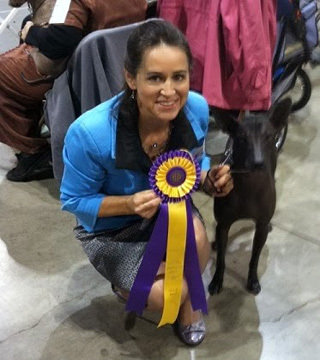 Bravo for Teresa and her standard hairless female Xolo, Munequita. We are so proud of you girls. 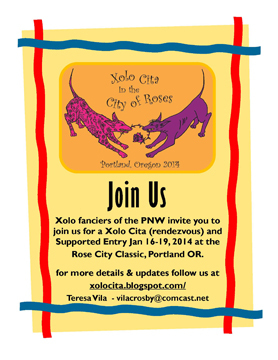 …on joining Xolo fanciers & exhibitors for a rendezvous at the Rose City Classic in Portland, OR, January 16-19, 2014! Follow the link below for more details! Hope to see you all there! 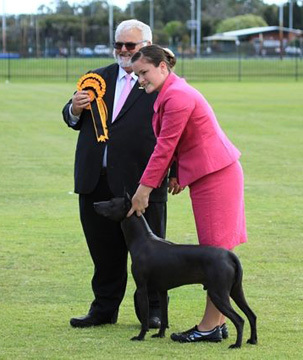 …news from Jacqi Dinis, that Besitos Naca took a RUBIS (runner up Best in Show) today! Such a sweet win for the breed, and for Naca & Jacqi. Proud is what we are.